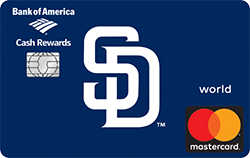 San Diego Padres Extra Bases Mastercard offers new cardholders 0% financing on purchases for the first 12 billing cycles. As an extra incentive, after a qualifying first purchase of $500 or more, you receive an additional 15,000 First Use Bonus Points, redeemable for a $150 statement credit. Show your support for the San Diego Padres this season and be rewarded in return for your loyalty by applying here and selecting the Padres as your team. Discover it credit card users save 5% (up to $1,500) at restaurants (activation required) from July 1 through September 30, 2018. Restaurants include fast-food (McDonalds), cafeterias, cafes, full-service places. All other purchases earn 1% cash rewards made with your Discover it card. The Discover It NHL credit card also offers 5% rebate on restaurants for this quarter. Get 0% financing on all your purchases for 14 months from the date of account opening to help spread out the bill for a large purchase, plus 1% rebate on its cost. For new account holders Discover matches cash back rebates at the end of your first year, that’s up to 10% cash back (limits apply). Note: if the account is closed before 12 billing cycles, there will be no match. All these perks are given to the cardholder with NO annual fee! Note: Price protection is like price matching between sellers and is also useful for grocery, clothes, and other items that frequently change price or are available at other places for less money. Note services, clearance, out-of-business, and such are excluded. Bonus Discover Deals gives cardholders 5% or cashback rewards all-year around when used for online purchases with selected merchants. 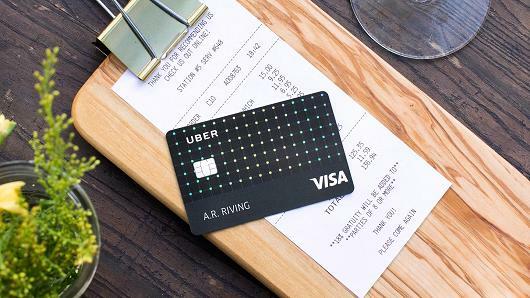 Uber credit card offers new account members a $100 sign-up bonus after $500 of net purchases within 90 days of approval. Pay no annual fee and use it anywhere VISA is accepted. If you decide to carry a balance, which is a highly discouraged practice on credit cards, the annual interest rate (APR) will range from about 16 percent to 25 percent per year. The card’s underwriter, the bank that actually grants you the credit line, is BarclayCard. Applications will be available starting Nov 2 when the card debuts on the Uber app. * The catch for the $50 subscription credit is a fairly large one: you must spend $5,000 or more in total net purchases on your account during each 12-month period through and including your account anniversary date. New York Knicks BBVA Compass American Express Card members will receive a new non-branded BBVA Compass AMEX card in September 2017. The partnership with American Express and BBVA Compass will continue for existing cardholders as before, except any NBA-linked promotions are terminated. Stay tuned for details as they become available. You can even redeem rewards for immediate cash-back statement credits. Here is how it works: after a purchase BBVA will send you a transaction alert via the BBVA Wallet app so you can redeem your rewards quickly to pay part or all of your purchase from your available rewards balance. Fans can buy stuff at the official New York Knicks online store with the usual forms of payment. Get official gear and souvenirs, such as jerseys, t-shirts, hats, collectibles, memorabilia, gifts, home and decor items and many other exclusive products not found elsewhere. The itemized list below gives you some of the services, perks, insurance and security benefits that come included with the American Express card at no charge to you. BBVA wallet app tracks card purchases, along with other cool features. Sorry, no new BBVA Compass American Express credit card accounts are being issued at the present time. Instead you can apply for a new BBVA Compass VISA card, which is available with no annual fee and the choice of earning up to 3x points in categories you select. For loyal New York Knicks fans, check out their latest news through the links below. Download the brand new version of the New York Knicks Official Mobile App for iPhone, iPad, Apple Watch and Android. Get Knicks news, stats and videos, plus offers not available anywhere else. Interactive maps for concessions, parking, etc.